Observant readers will notice that two sides are recorded on dates almost two years apart, which, aside from the two different line-ups, serendipitously spans the transition from Van Gelder’s Hackensack home studio to Englewood Cliffs, so you can listen out for any engineering differences between the two sides. My own first review of Jackie’s Bag was written back in 2013, for the mono edition, here., no need to repeat myself, save that it’s a cracking record with loads of the musicians on fire, especially desirable for its generous helping of Tina Brooks, who is otherwise in short supply. “Jackie Mack is back! I remember when this album first came out my musician colleagues and I played it over and over, especially Appointment in Ghana, which dipped a toe into the emerging modal world. The word poignant was invented to define Jackie who could rip your heart out at a ferocious tempo with his instantly recognizable bizarre and unique tonality. Two groups here, Jackie, Donald Byrd up front with Sonny Clark, who would go on to record and work often with Jackie, who always understood where Jackie wanted to go. Chambers and Philly Joe step left from working with Miles at the time but get well into Jackie’s Bag. We jump to group 2 with the underrated warm toned Blue Mitchell who also played with passion and élan but the real treasure here for me is the performance of Kenny Drew who was obviously a source of influence to Sonny Clark as well as Herbie Hancock, Wynton Kelly and others. He has Bud, pre-Silver church funk, rhythm and original melodic invention with swing that never stops. I wish he hadn’t moved to Denmark so we could have had more albums under his leadership with New York players. Paul Chambers borrowed from Miles and Arthur Tailor a disciple of the Kenny Clarke, Blakey, Philly Joe east coast hard boppers is also in great form. Personally, I’m with him. Next up, Eeeyie Caramba!, it’s Salsa Time! Characteristically wide soundstage extending beyond the speakers, rich, dynamic and crisp presentation with clarity and focus on the music. Very detailed information for all instruments, attack and decay, vibrato, sustain, very few if any reproduction artefacts to distract you, the top and bottom registers are satisfyingly detailed and natural, instruments have that tactile presence you look for in high-end reproduction. To cap it off, silent invisible vinyl makes it a delight to listen to. The earlier Hackensack session has a little more hard-panning, as you might expect, with Van Gelder’s evolving approach to recording, but it’s not “fake stereo” (see Collector’s Corner) A lot of great playing, and great tunes, it’s Jackie’s album, but some of the best moments are the contribution of the other players: Tina Brooks youthful risk-taking on tenor, Kenny Drew’s melodic inventive flow, Sonny Clark’s bubbling comping, Mitchell and Byrd’s warm steadfast brass tones, Chambers always there, a rhythm section of dependable old friends, it’s all truly in Jackie’s Bag. Collector’s Corner: what’s the alternative? 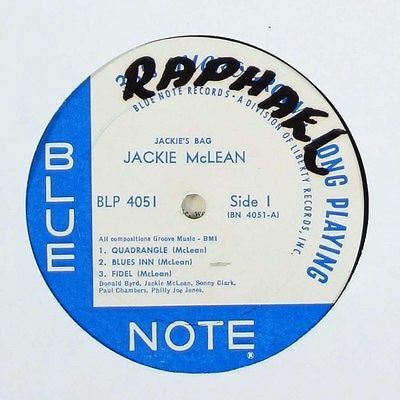 Whilst I already have established a generic history of the iconic Blue Note label over the decades, I wanted to trace the evolution of one specific recording from its first issue through to the modern day, to see what lessons and new information might be picked up along the way. A Music Matters review copy of Jackie’s Bag seemed as good an opportunity as any. 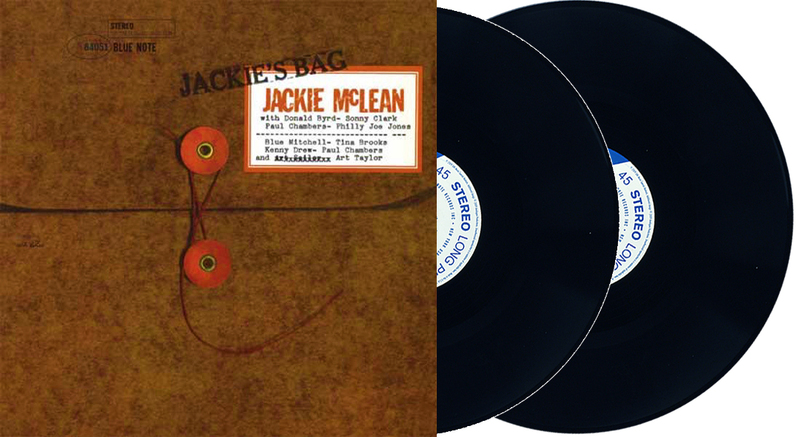 So here follows an illustrated round-up of the reissue history of BLP 4051, Jackies Bag. There are a few interesting twists along the way, so one for vinyl detectives: a cold case study. Original pressing released May 1961: mono, 47West 63rd label, ear, RVG, deep groove. This issue was post-incorporation so the label is attributed to Blue Note Records Inc, with ® below NOTE. I am fortunate to own this, and it is huge room-filling mono, RVG experience takes no prisoners, ultimate quality, just perfect. Forget what is on the tape, that was merely a step on the way to create this. Popsike picks up the story, and it’s not good news for fiscal austerity. The piggy bank really needs be fairly obese to have postie deliver one of these to your home. Popsike’s Top Twenty Five auctions gives you a feeling for the target price of best condition original copies. Not quite in the Holy Grail league, but still a significant purchase for the collector of original pressings. 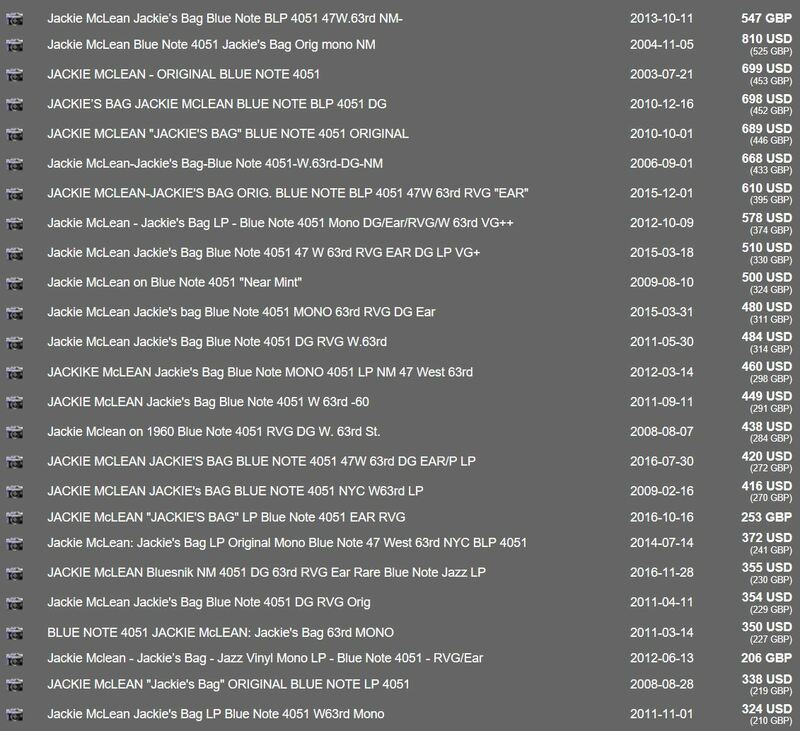 I reckon perhaps a thousand copies of the early Blue Note pressing exist in collectable quality condition. It should be possible to construct an algorithm based on number of high quality copies auctioned, and average price of originals of high quality , which translates into a number, a “scarcity/desirability index”. I might give it a go. The 1st pressing according to Cohen is deep groove, however, there are a lot of copies on 47 West 63rd label without a deep groove, such as mine, below. Among the highest price auctions, note occasional omission of DG in the description. Fall 1961 was around the time new non-DG dies arrived at Plastylite, first seen on records released in September 1961, also around the arrival of the NY label. It was customary to use up old stock labels first, the many non-DG copies on 47 West 63rd could have been pressed some time into the NY label era (1962-66) before applying a newly printed NY label. .
Just to confuse the collector, a second issue appears on NY labels, found with and without deep groove (with deep groove pictured below). Though deep groove is closely associated with early titles, from 1962 and the following three to four years, DG dies appear randomly, and are potentially misleading of provenance. 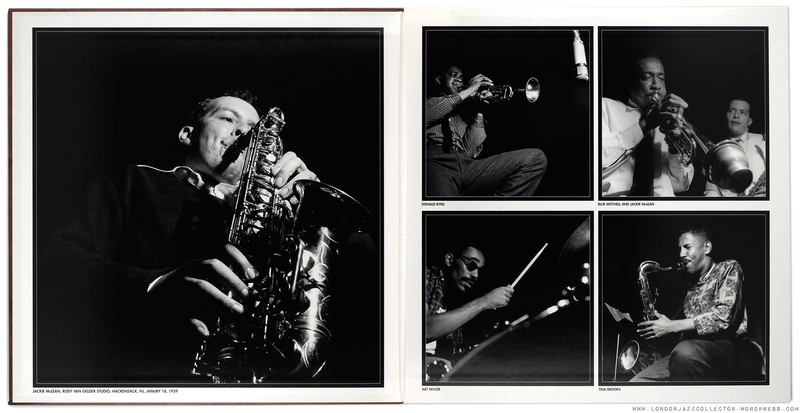 The Blue Note era ends in 1966 without a stereo edition. With stereo the new consumer format of choice, Liberty continued to issue both mono and stereo, mono available for those who had not yet migrated to the new-fangled stereo phonos. Liberty issued a mono edition on Division of Liberty label as no NY was in the inventory, a copy I found with a cannibalized original mono cover. No ear, and unhelpfully no information if it had RVG metal. The record was owned at one time by someone called “Raphael”. Raphael clearly hung out with the wrong crowd or went to the wrong sort of parties, as he felt he needed to protect his ownership of Jackie’s Bag by writing his name in large black felt tip on the label (left, and cleaned up with Photoshop, below). Sacrilege, Raphael, that’s Blue Note, man. May be you need to change your friends. Great record though. Umm, may be, I could borrow it? Bring it back Tuesday. Honest! In the modern age borrowing and lending records doesn’t really happen any more. Borrow your download? The Arrival of the “Stereo” edition BST 84051 (sort of). 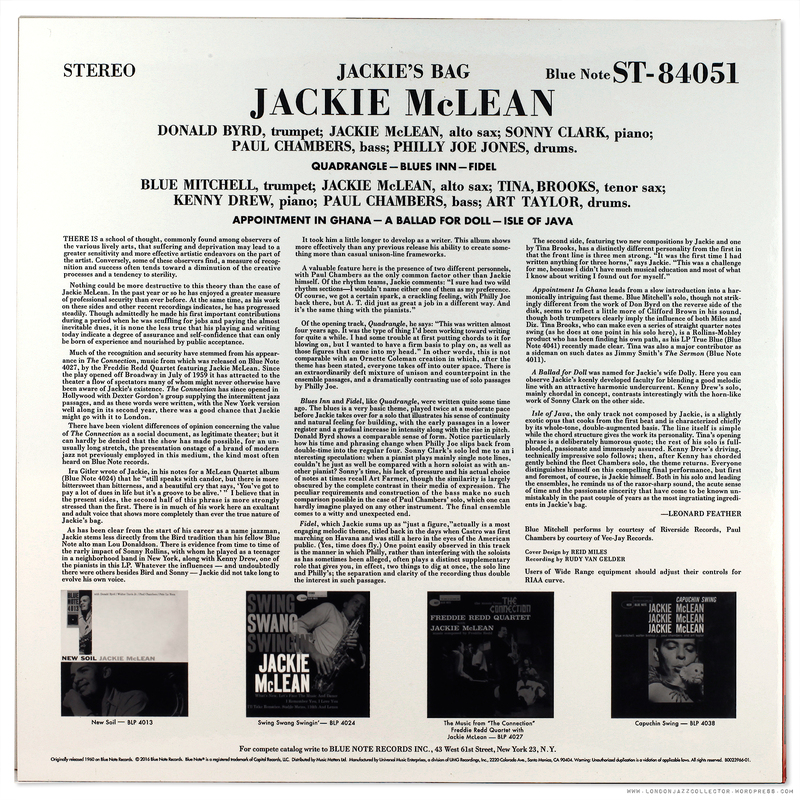 Original Blue Note confined itself to issuing Jackie’s Bag in mono. Cohen confirms Liberty Records was the first to release a stereo edition (below) . But what’s this? Where the catalogue number used to be, “Electronically re-recorded to simulate stereo” says the top right corner. Oh dear, the first release in stereo by Liberty appears to be “simulated stereo”, fake stereo. May be they just pretended it was simulated stereo to please the Marketing people and the engineer left it in mono, such things happened. Or may be it is real stereo pretending to be fake? Red pill or blue pill? Van Gelder was well into his two-track recording system, the tape exists with two tracks, what’s the story here? Honesty Box (empty.) I didn’t see a single seller own up to the simulated stereo claim, merely “stereo”, and none of the pictures were sufficiently sharp to allow you to read it, only the smart collector would be in the know. The hybrid west coast Liberty/UA Inc. kicked off with their stereo release on their distinctive black turquoise label. Normally these are excellent quality vintage reissues, many with Van Gelder heritage, but in this case the “simulated stereo” claim continued. May be the liner notes artwork was just reused thus repeating the earlier “simulated” claim, but in error. Unusually for this mostly mono Division of United Artists reissue series, this too was issued “electronically re-recorded to simulate stereo” exactly as Liberty, probably using the inherited metalwork, to save a re-mastering job, (they’ll never know) . UA also gratuitously add a note at the foot of the jacket “an original stereo recording”, words which do not appear on the Liberty, and contradict the UA cover claim. GXK 8082 1977-80 Blue Note Masterpiece Selection 150 Series – presumably stereo – no other information or pictures found. October 1992, late in the day, Toshiba grab stereo by both horns, no monkeying around with those simulations, full-bodied stereo. However by 1992, CD was in the ascendancy and engineering increasingly saw the influence of solid state, transistors, and other contamination of the analog pathway, so I tend to shy away from ’90s Toshiba. Note Toshiba opt for a facsimile New York address label, sloppy. Assorted Capitol Manhattan, French Pathe Marconi, and Cadre Rouge Audiophile (allegedly) emerged from the ’80s US and European EMI initiatives. Barcodes ugh! Finest in Jazz, certainly, finest in vinyl, often not. 200 gram super quiex vinyl, bonus features include “deep groove”, correct 1st pressing label address 47 West 63rd, and have a little respect, mono. including bonus tracks from the same Tina Brooks session, issued on vinyl in Japan by King Records (below), also found on the Complete Tina Brooks Mosaic. No-one has the time or resources to go through all the dozens of reissues. Just decide your own price-point and work with that. Eventually, I obtained a mono 47W63rd original, no dg. Do I care about the DG? Not for a second, I love my mono press, but the stereo is nice to have, and it’s not simulated, as far as I can tell. Great music. Did I miss anything? Does anyone have any insight into the strange “simulated stereo” editions from Liberty and UA? Anything to add? P redictions are difficult to make, especially about the future. The last year has been one of many unexpected surprises. I expect the next year to be the same, full of surprises too. I’d be surprised if it wasn’t. “Happy New Year!” Thanks for reading, and special thanks to those who take the time to comment, makes the effort worthwhile for me. 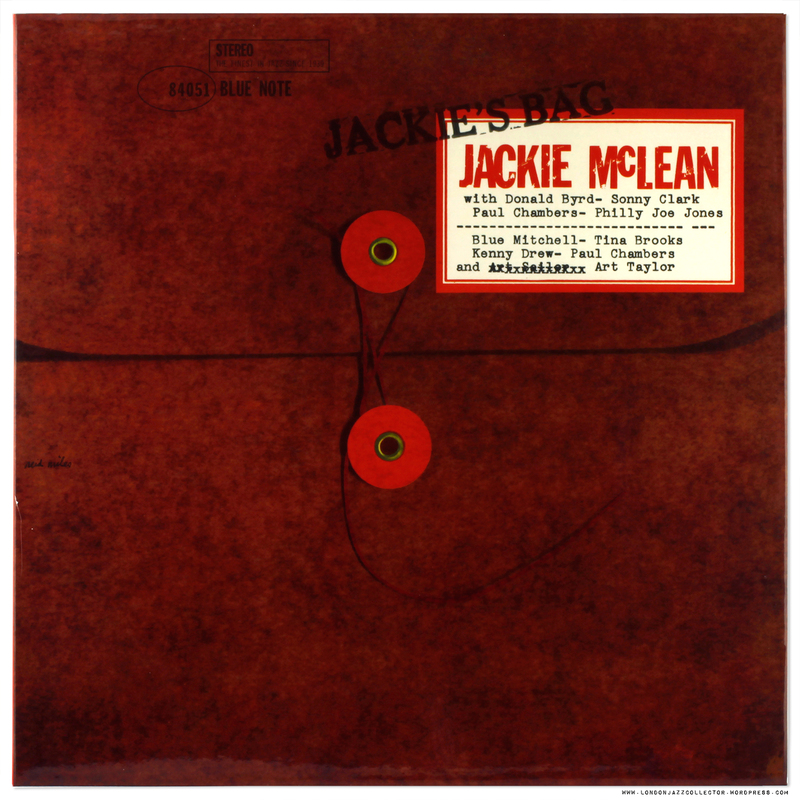 This entry was posted in Blue Note, Jackie McLean by LondonJazzCollector. Bookmark the permalink. New here but I’ve been around. I happen to have the same NON DG all else is ok. I actually bought it in NYC a few weeks ago. I brought it to Fred Cohen and he took a good look at it. A conversation ensued that I will never forget for blue note collecting purposes ever! Anyways we had a discussion about this very pressing. 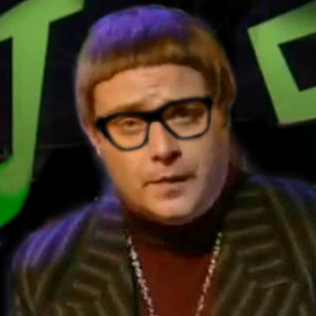 The same as you and I have London jazz collector. It’s a nice record. Mine does not have the sound a lot of my other blue notes. It’s a bit thin as well compared to most of the others I have from the early 60’s non DG or DG. I have the Pathe Marconi and my opinion of it is the same as all my reissues – does it sound as full, rich, punchy and glorious as an early BN? Absolutely not. Is the music some of the best ever made? Definitely. At $8-$15 USD, the price is just right. I get lost in this one, so the thinness of the DMM is forgotten about a minute in, like all the others. Would love to upgrade one day, but just happy to have a copy for my living room. I now have around 10 MM33s and 45s and they are all wonderful. I would love to have the entire MM catalog frankly, even to back up originals I have. Would recommend to anyone looking for high quality. Great writeup LJC! Now I have to pull this one off the shelf! I have the Liberty White-Blue STereo and it is indeed true real stereo. The jacket is just wrong and misleading. I consider it a first stereo release. Perhaps it is just me, but for some reason the Music Matters gatefoalds feel wrong to me. It is not the vinyl! They sound great, no doubt. And the extra pictures are beautiful. But a Blue Note record gatefoald cover somehow does not work for me. I wish they would just print an extra insert for the pictures and put that in a single sleeve. Of course these reissues are a great alternative when you can not afford an original pressing. And I know, it should be about the music only – but when I put on classic jazz records a vintage cover is half the fun. Just curious if anyone else feels this way about the MMs, too. I will try to get used to them, though. Their “Cool Struttin'” edition I recently got really sounds brilliant. Happy New Year, LJC, and thank you for another illuminating post. My copy is a Liberty ‘Electronically Re-Recorded to simulate Stereo’ which has always sounded much more punchy than other such stereo-esque BN titles I’ve heard, and has always led me to hang onto it despite its apparent lack of pedigree – just circumstantial at this stage, but interesting if there is more than meets the eye regarding the stereo conversion. My copy is a French one. Direct Metal Mastering (oops!?). Oh well, it’s sounds very good to my ears (can’t compare with anything else) and the playing is just stellar. Thanks for your excellent articles and I hope you will come up with more in 2017. Plenty more in store for 2017, fear not, Andre! Some of those Pathe Marconi re-editions can punch above their weight. Yesterday afternoon I had an interesting listening session with a friend. We like to A:B compare different editions of the same recording drawn from our respective collections. The latest twist is we do a blind test – one spins the discs, the other listens blind, and talks out their response. We pitch in originals, vintage reissues, Japanese and modern audiophile.Ditch all the confirmation bias that comes from believing “these editions are better than those”, its just what you hear. You get some shocks, which is healthy, keeps you on your toes. In the schedule, we compared three copies of one recording and the Pathe Marconi DMM was best of three. Now if we had an original, which we didn’t (£000’s) who knows. I have to say, original Blue Note mono so far beats all contenders, but beyond there it gets quite interesting. I should also say we also A:B wine with the music. Yesterday was French white: Hommage du Rhone Châteauneuf-du-Pape , against a Jean Luc Columbo La Redonne Saint-Péray, I think from the other Rhone bank. Both wines were highly acceptable, one was more enjoyable than the other. If you don’t compare, you don’t know. And this one is for completists only: the Tina Brooks / Mclean record on King (Street Singer) is more or less essential too, as it contains the tracks Medina and Melonae’s Dance. These two tracks are not on the Complete Tina Brooks Mosaic box set unfortunately. I think my copy of this is an indifferent Toshiba. In any case it isn’t a record I have played very much and am not overly familiar with. I still prefer my Jackie with a splash of something else — typically Grachan Moncur III, as now, on HIPGNOSIS, which I am playing as I write. This one is a Heavenly Sweetness reissue and to my ears (which isn’t saying much) sounds very acceptable. Lovely loping grooves. HAppy new year to LJC and all. Hipgnosis is an outstanding title. Grachan Moncur III (and Roswell Rudd) convert the J.J. silky swinging marching band trombone into a instrument of darkness and terror. Happy New Year, may we all continue to celebrate our differences. First, in the opening paragraph you mention the possibility of tonal differences between the two sides due to the change in recording studios. Do you notice anything? And second, a more general question, what did you use to remove the black magic marker from your mono Liberty and leave the label intact? I’m assuming Photoshop removed the marker. That’s the simple approach. But I always expect something more miraculous from LJC. That is a good question and difficult call, as the biggest difference between the two sides comes across to me as the difference between Donald Byrd and Blue Mitchell, two outstanding trumpet players. Is one better than the other, or has RVG recorded one better than the other? Having thought about it a bit more, it would be surprising if there were obvious differences. He probably used the same microphones, recording techniques, etc in both studios. And having developed such a refined sound, he likely took efforts to preserve it. 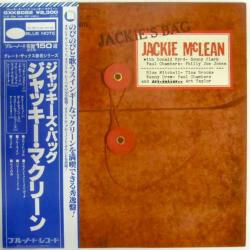 I have a Liberty “electronically re-recorded to simulate stereo ” of Jackie’s Capuchin Swing purchased for a few dollars. My thought at the time was “fake stereo? Normally no, but at this price, sure, why not”? Upon playing I was happy to find it was fake-fake stereo! Makes me think “electronically re-recorded” ( as opposed to “electronically re-mastered”) meant first use of two track master but labeled as fake stereo to make it sexier to the record buying public. That is very helpful, thank you. The word “simulate”, make it sound as though it was stereo, a fold-down tape, unfolded, I can see that. Thing is, I have a copy of JJ Johnson BN 1506, which we know can only be single track mono, which has the same “Electronically re-recorded to simulate stereo” tag, which is harder to explain other than fake fake stereo. The jury is still out! I can confirm that the “Division of United Artists” pressing you picture above also is most definitely true stereo. I was worried about the “simulated stereo” annotation when I saw this in the store, but there’s no way listening to this that it’s fake stereo. Nice WWWIIIDDDEEE stereo spread and beautiful sound. CAUTION: ANY CLEARANCES CONTAINED IN THIS EMAIL ARE “SUBJECT TO CONTRACT” AND ALL RIGHTS ARE RESERVED. THE INFORMATION CONTAINED IN THIS E-MAIL AND ANY ATTACHMENTS THERE TO ARE CONFIDENTIAL AND ARE INTENDED ONLY FOR THE USE OF THE ADRESSEE(S). IF YOU ARE NOT THE ADDRESSEE YOU MUST NOT COPY, DISTRIBUTE, DISCLOSE OR DISSEMINATE THIS E-MAIL ITS CONTENTS OR ATTACHMENTS TO ANOTHER PERSON OR TAKE ANY ACTION IN RELIANCE ON IT. IF THIS E-MAIL HAS BEEN SENT TO YOU IN ERROR PLEASE NOTIFY THE SENDER IMMEDIATELY BY E-MAIL AND DELETE THIS E-MAIL FROM YOUR SYSTEM.